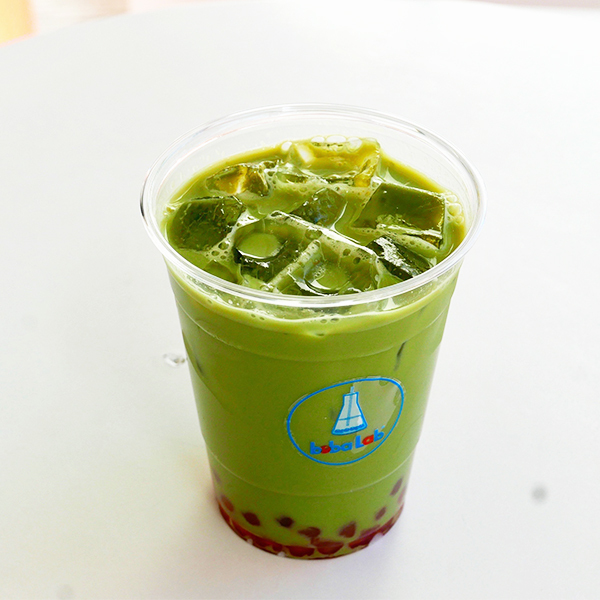 Lyn Chen opened Boba Lab in 2016 on Pico Boulevard by SaMoHi. Her beaker logo features a fat straw for inhaling boba, the addictive tapioca balls served in iced teas that aren’t just popular with students. One Boba Lab wall sports the periodic table of elements and an overhead menu touts Tea Elements, Blended Elements, and Food Elements, your experience’s building blocks. Beverages are milk tea, fruit tea, cream, or lemonade-based. Blended drinks include chocolate banana smoothies, frozen cappuccino, and sweet corn cream. Substitute alternative milks like soy or almond and add toppings like lychee jelly, red bean, and sea salt cream. Atypical boba include berry and “seasonal” hazelnut or toasted marshmallow. Bonus: Boba Lab uses no powders and allows variable sweetness. The Westernmost outpost of Bobak Roshan’s avant-garde specialty coffeehouse chain, Café Demitasse, resides across Wilshire Boulevard from the Third Street Promenade. 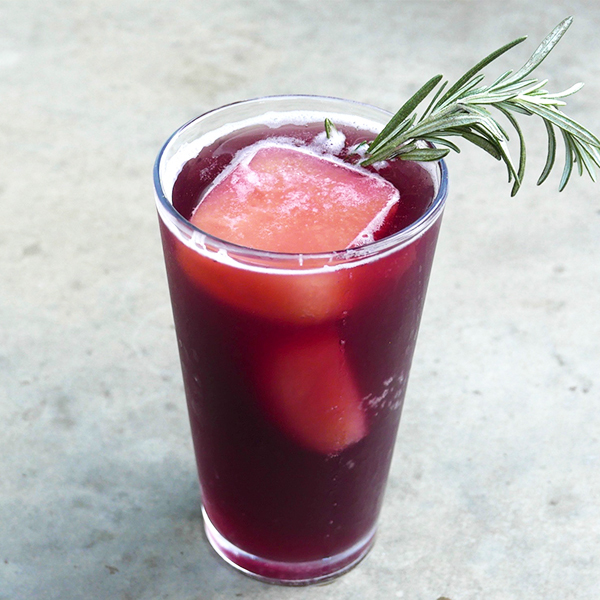 Seasonal shrubs come in flavors like grape-rosemary, which comes with carbonated water, a granita-like, bittersweet grapefruit-honey ice cube, and aromatic rosemary garnish in a pint glass. At other times, you might find a pineapple-ginger-turmeric variation. Demitasse also serves fun iced coffee and tea drinks that warrant their own detour. Simone Acciai grew up outside Florence and teamed with fellow Italians Nicola Cambuli and Francesca Mallus to deliver their favorite childhood treat to Dolcenero Gelato on Main Street. The small, glass-fronted gelato shop opened in 2015 in a strip mall and features four dark-stained wood high-top tables and stools inside, a few plastic chairs out front, a black corrugated metal roof, and colorful bins of gelato. 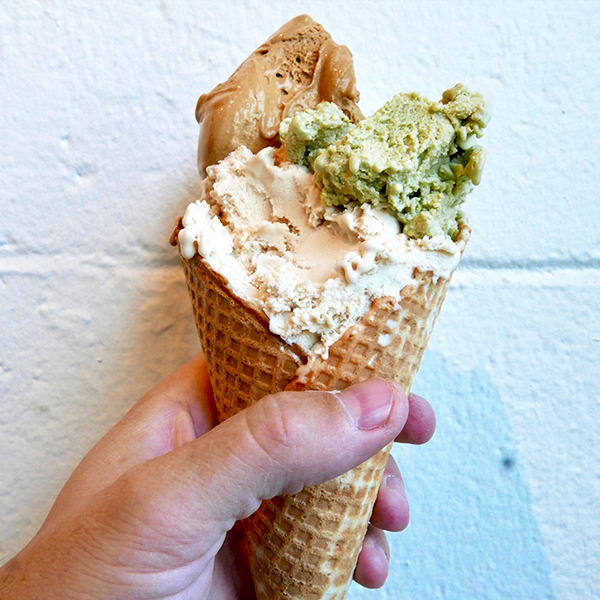 No-frills flavors include ricotta & fig jam, Sicilian pistachio, Piedmont hazelnut, and rich butter salted caramel. 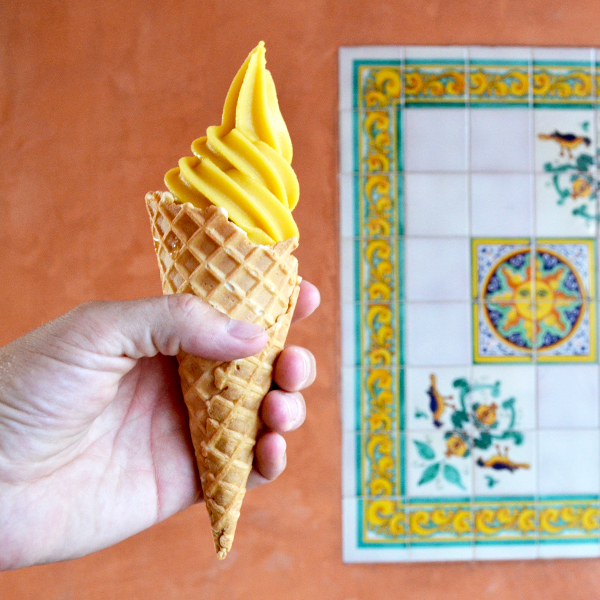 Gelato’s available in cups, sugar cones, house-made waffle cones, or affogatos. Victoria Philippou and husband Michael hail from London and run Frozen Fruit Co. on Montana Avenue. Their tiny glass-fronted shop with purple walls resides at the base of a two-story office building with mauve smooth coat and decorative tile. They’re marketing naturally sweetened fruit soft serve as “healthy plant based frozen treats.” They sell four kinds of frozen fruit: chocolate co-starring coconut milk, cacao, and dates; a version with similar payload, plus mint; sweet tart passion fruit with pineapple, pear, and peach; and strawberry cream with coconut milk, apple, pear, and peach. The cone’s sweetness helps to provide crunch and balance. They also have cups and coconut shell bowls garnished with pink dragon fruit powder and edible flowers to up their Instagramability. Go Greek Yogurt launched in 2012 and promises yogurt (fresh or frozen) that’s “rich in protein and probiotics and lower in sugars and calories than other frozen yogurts.” Tangy Greek fro-yo comes in a variety of flavors and toppings at their Santa Monica outpost with blue umbrellas, curved wooden lounge chairs and stools, and curved white ceiling. Find fresh yogurt up front and frozen yogurt machines on the back wall. Greek honey & plain tart makes for a great swirl, especially with toppings like dates, walnuts, cacao nibs, and dark chocolate shavings. Depending on the season, other flavors sold by the ounce might include wild berry, chocolate, pomegranate, pumpkin spice, and eggnog. 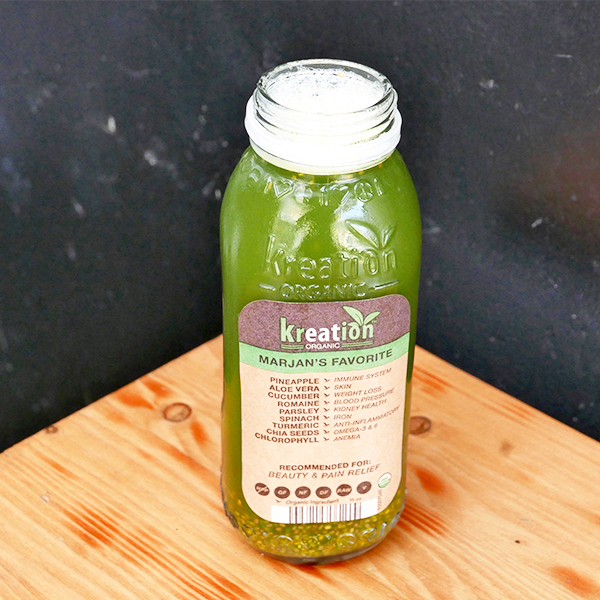 Marjan Sarshar founded Kreation Kafe & Juicery, a thriving local chain known for flavorful health benefits. Her Montana Avenue outpost features reclaimed wood walls, a wraparound patio, and full food program, plus cold-pressed juices and smoothies and flavored alkaline waters. Grab-and-go fridges house bottled juices like Marjan’s Favorite, a green juice named for the owner with turmeric, aloe vera, chia seeds, cucumber, romaine, parsley, spinach, and chlorophyll. Each bottle’s label lists what the juice is recommended for, in this case “beauty & pain relief.” Each ingredient is listed with a corresponding benefit. For instance, aloe vera aids skin, parsley for kidney health, and chia seeds for Omega-3 & 6. Other juice names on the color-coded menu more explicitly state their purpose. “Energy” combines carrot, apple, ginger, and bee pollen. “Digestion” teams lime, fennel, mint, apple, ginger cucumber, and apple cider vinegar. “Hangover” packs more of a punch, teaming lemon with ginger, tomato, cayenne, and cucumber. Redeem your used Kreation bottle and get a buck back at the register. 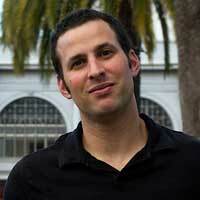 Vincenzo Sottile, whose family hails from Turin, Italy, rebranded StickHouse as Merci Clement. 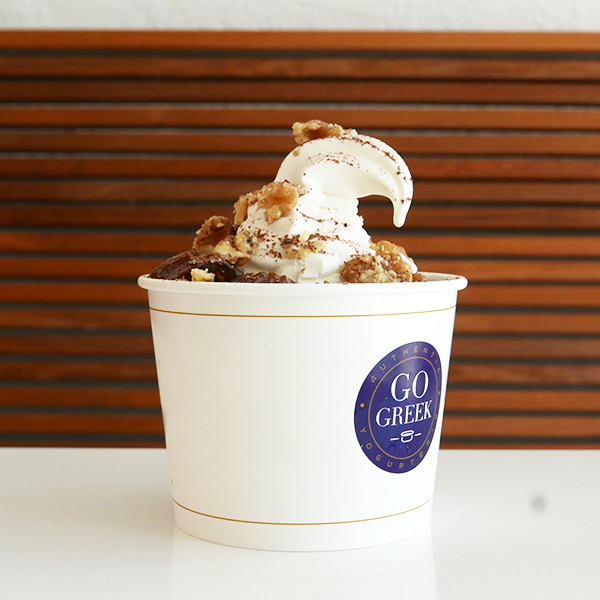 This retooled bakery and gelateria also has a branch in Beverly Hills. The Santa Monica location around the corner from Third Street Promenade touts a gold, white, and wood color scheme and sells two gelato popsicles: tiramisu and strawberry cheesecake with a swirl of icy fruit and cream. Dip in chocolate or add shaved coconut, sprinkles, and crushed nuts (almonds, hazelnuts, pistachios, or peanuts) for an extra $0.99. 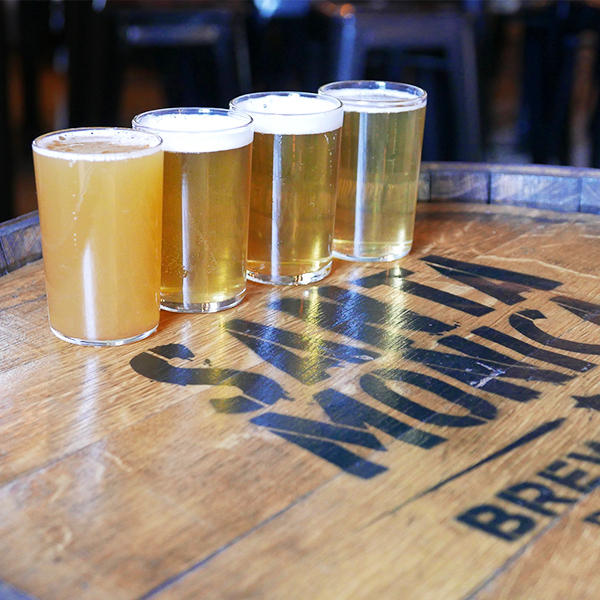 Lawyer Scott Francis and business partners Carl Sharpley and Richard Super pivoted toward craft beer with the opening of Santa Monica Brew Works near the 17th Street Expo Line station. 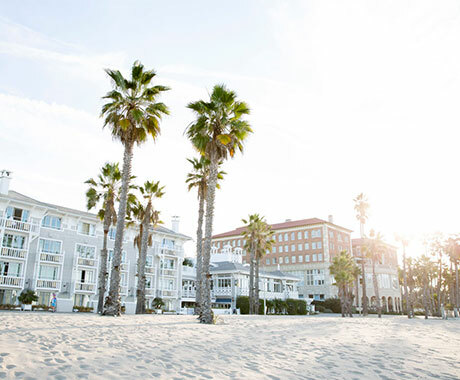 The trio produces “beach brewed” beers in a building with corrugated metal and olive green facade. High-top wood tables provide views of the brew kettle, fermenters and brite tanks. 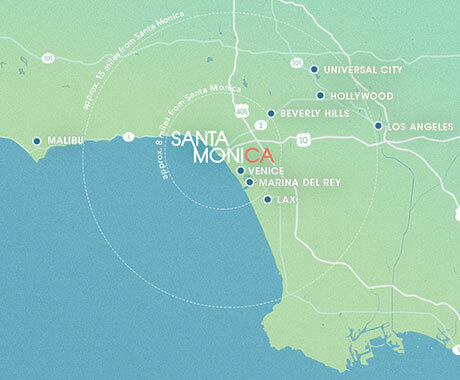 Flat screen TVs show sports, and sporty runners and cyclists visit on weekends, which fits with the “world-renowned Santa Monica lifestyle” they promote. 22 beers on tap include five core beers – 310, PCH, Wit, XPA, and IPA – plus seasonal favorites. Flights ($12 for 4 5-ounce pours) may include Nitro Wit brewed with orange and chamomile, Hazy There Will Be Juice NE Double IPA, Cucumber Kolsch, and spicy Chile Pepper Pale brewed with habanero, lemon drop peppers, and citrus zest.